Hello friends, today billion of users love to use Android Smartphone, due to different easy to use and very useful features. But they are facing problem to recover accidentally delete important photos, messages. It’s very difficult to recover those photos which are stored in your phone memory, but you can easily recover deleted photos which is stored in your memory card. So, today we discuss easy to use way from which you can easily recover deleted Photos, Message, Contact from Android Device from memory card in this article. 1. When you delete any photos from your memory card these photos are not removed permanently but these are hidden for users. 2. Take complete backup of your memory card in your computer. 3. If you format your memory card then you cannot recover your important photos. If these deleted photos are stored in your phone memory then immediately stop to click new photo, because these deleted photos are hidden for users by the operating system of your smartphone and if you store new photos then these photos takes place of your delete or hidden old photos. So be careful don’t take new photos from your smartphone until your recovery process is completed. 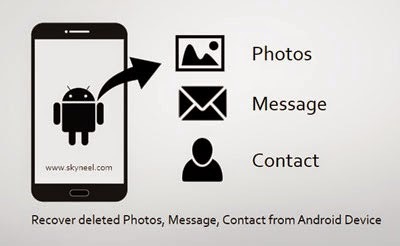 If you are a good professional programmer then you can recover Recover deleted Photos, Message, Contact from Android Device from the root level of your phone, but if you don’t know this skill then you have to use different recovery software like “Asoftech Photo Recovery” from which you can easily recover your deleted photos. You can easily download this software by clicking on this link asoftech.com/apr/. This software works on different file systems like FAT12, FAT16, FAT32 and NTFS. After downloading this software you have to install this software in your computer then after connect your memory card with the help of card reader from your computer. If your deleted photos are save in your phone memory and now you want to recover them then first connect your Smartphone with the help of USB cable with your computer and then click on the “Asoftech Photo Recovery” software, select the drive from which your photos are delete, after selecting the drive this software automatically start scanning process. When scanning process of this software is completed it shows all deleted photos, now select those photos which you want to recover one by one or select all then click on the “Recover” option. All deleted photos are automatically recovered in your phone with the help of USB cable. If your photos are deleted from internal memory of your phone then you must use paid recovery software, with the name of Android Recovery Manager Software for all Android phones. With the help of this software you not only recover your important photos but also recover all deleted messages and contact list also. It’s chargeable software which is downloaded by clicking on this link android data recovery. 1 Install and download this software in your Android smartphone. 2 Connect your phone with the help of USB cable. 3. Turn on “Android Recovery Software”. If you have Android 2.3 or any previous version then click on the “Settings” option > Click “Applications” > Click on the “Development” option > Turn on “USB Debugging” option. If you have Android 3.0 to 4.1 version then click on the “Settings” option > Click on the “Developer” option > Turn on “USB Debugging” option. If you have 4.2 or upper version then click on the “Settings” option > Click “About Phone” option > Tap on the “Build Number” until it shows this message on your phone “You are under developer mode”. It shows different option you can select any one or all required option which you want to recover like “Contacts”, “Messaging”, “WhatsApp messages and attachments”, “Gallery”, “Audio”, “Video” and “Documents” then click on the “Scan for deleted files” option. Now please check your device to see if there’s a pop-up displayed Admin request > Click on the “Allow” button and confirm your request otherwise this app not finish scanning process properly > Select all deleted files then click on the “Recover” button. Read these given steps carefully and do this job otherwise you not able to recover deleted Photos, Message, Contact from Android Device, I have no liability if this process is not done properly. I hope you like this post; give your important suggestion in the comment box. Thanks.